Historically, cultures that used a money system different from the one we use today lived centuries of unprecedented prosperity, health, and cultural progress. By changing the types of money we use, we can shape our economy and our society to benefit all. Our current global money system is a mess. This is not just due to the inability of world and national economists to control the system. The problems are more basic than that. Historically, cultures that used different money systems reversed these issues, and lived centuries of unprecedented prosperity, health, and cultural progress. Money is an agreement to use something as a medium of exchange. Currency is money in circulation. Many things have been used as money and as currency, and several different money systems have been developed. Based on how money systems affect the human psyche, they can be divided into Yang money types, and Yin money types. All of the current national money forms are fiat currency, which is a type of Yang money. 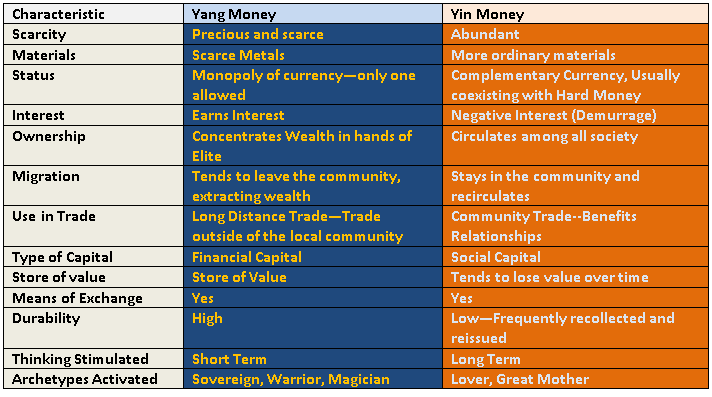 Yang money tends to activate certain characteristics including protection, hording, competition, scarcity and control. Many complementary currencies are Yin money types, which activate other characteristics such as cooperation, community, and abundance. Complementary currencies work best not as a total replacement of the national money system, but in a complementary role, alongside the strong yang money. Yin-type complementary currencies have allowed the communities which use them to have islands of prosperity in the midst of international depression, and even in normal economic times, to enjoy economic prosperity 75% greater than the surrounding region. Other money systems, such as cryptocurrencies, can be used along with national money and local currencies in a whole ecosystem of currencies. This provides a more resilient money system, without the booms and crashes we experience today. 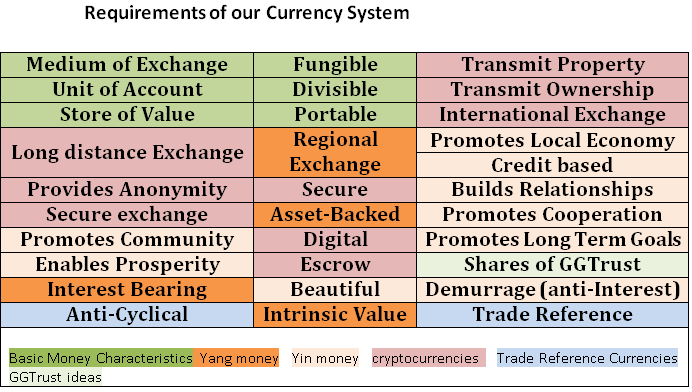 GGTrust proposes a system of Yin-type local currencies to increase local prosperity and community. We also propose an international yin-type currency which will complement the current Yang fiat money and the coming inernational gold-backed money system. We believe that our GEO currency will increase prosperity for those who use it, preserve freedom and privacy, encourage long term thinking, balance the cycles of global economics, and increase gender balance, cooperation and community. It will include the positive characteristics of Yang money, most of the characteristics of Yin money, and selected new opportunities from cryptocurrencies.